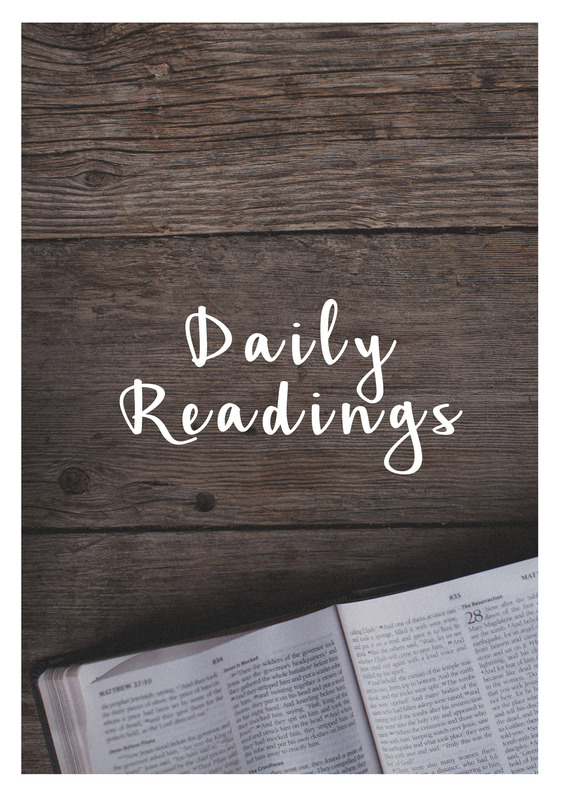 Due to the holiday season, the January Daily Readings were prepared far in advance of the Summer Series, and therefore are not connected with the content of the Summer Series. 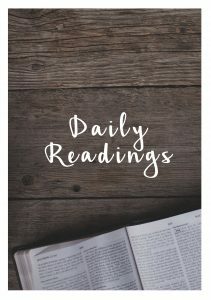 The readings will still follow the same format as before. But whatever were gains to me I now consider loss for the sake of Christ. What is more, I consider everything a loss because of the surpassing worth of knowing Christ Jesus my Lord, for whose sake I have lost all things. I consider them garbage, that I may gain Christ and be found in him, not having a righteousness of my own that comes from the law, but that which is through faith in Christ—the righteousness that comes from God on the basis of faith. I want to know Christ—yes, to know the power of his resurrection and participation in his sufferings, becoming like him in his death, and so, somehow, attaining to the resurrection from the dead. Not that I have already obtained all this, or have already arrived at my goal, but I press on to take hold of that for which Christ Jesus took hold of me. Brothers and sisters, I do not consider myself yet to have taken hold of it. But one thing I do: Forgetting what is behind and straining toward what is ahead, I press on toward the goal to win the prize for which God has called me heavenward in Christ Jesus. Are there things from the past year that you need to consider as ‘garbage’, that you need to let go of in order to take firmer hold of Christ? What things? Why? How will you do this? What does ‘pressing on towards the goal’ mean for you? Heavenly Father, you are the God of past, present and future. I offer up my past year to you – all of it, good, bad and indifferent. Help me release what I need to let go; teach me to hang on to the things of value for the year ahead. In Jesus’ name, Amen. What is the new thing that you think God is wanting to do in your life this year? What new thing is he wanting to bring about in our church and our local communities? Lord God, you are sovereign and yet loving, Lord of all and yet intimately interested in our lives. Thank you for your love and for the good, new things you have prepared for us. In Jesus’ name, Amen. By faith Abraham, when called to go to a place he would later receive as his inheritance, obeyed and went, even though he did not know where he was going. By faith he made his home in the promised land like a stranger in a foreign country; he lived in tents, as did Isaac and Jacob, who were heirs with him of the same promise. For he was looking forward to the city with foundations, whose architect and builder is God. And by faith even Sarah, who was past childbearing age, was enabled to bear children because she considered him faithful who had made the promise. And so from this one man, and he as good as dead, came descendants as numerous as the stars in the sky and as countless as the sand on the seashore. All these people were still living by faith when they died. They did not receive the things promised; they only saw them and welcomed them from a distance, admitting that they were foreigners and strangers on earth. People who say such things show that they are looking for a country of their own. If they had been thinking of the country they had left, they would have had opportunity to return. Instead, they were longing for a better country—a heavenly one. Therefore God is not ashamed to be called their God, for he has prepared a city for them. How easy do you find it to trust the promises that God has made to you personally, and to his people as a whole? What promises of God are you waiting on this year? Almighty Father, help me trust you more in the future, and about the future too. When my faith is failing, shower me with your grace and mercy, so that I may hold to your love and the promises given in love. In Jesus’ name, Amen. What pruning do you see God doing in your life in the year ahead? What things do you need to relinquish? Why? Lord God, though pruning and shaping and moulding can be painful, I know you do it because you love me. Give me strength to submit. Amen. But I trust in you, LORD; I say, “You are my God.” My times are in your hands; deliver me from the hands of my enemies, from those who pursue me. Let your face shine on your servant; save me in your unfailing love…. How abundant are the good things that you have stored up for those who fear you, that you bestow in the sight of all, on those who take refuge in you. In the shelter of your presence you hide them from all human intrigues; you keep them safe in your dwelling from accusing tongues. Praise be to the LORD, for he showed me the wonders of his love when I was in a city under siege. In my alarm I said, “I am cut off from your sight!” Yet you heard my cry for mercy when I called to you for help. Love the LORD, all his faithful people! The LORD preserves those who are true to him, but the proud he pays back in full. Be strong and take heart, all you who hope in the LORD.